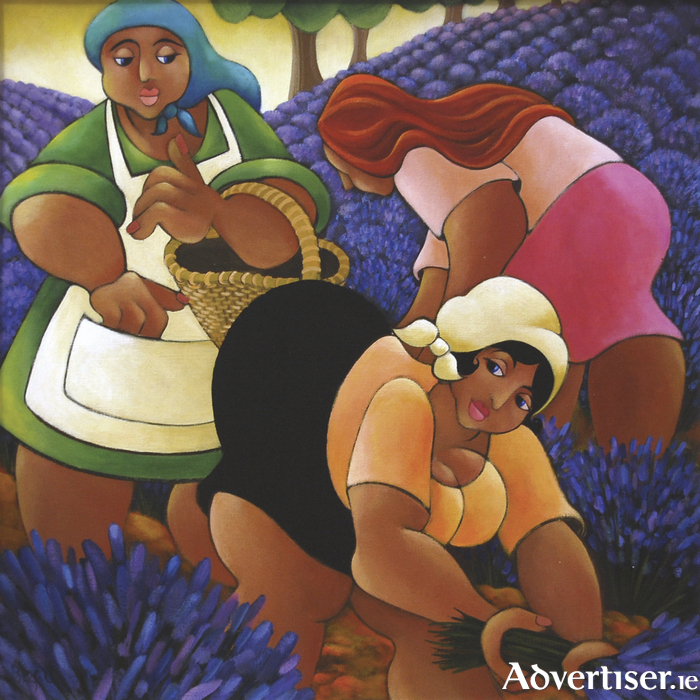 Lavender Ladies by Stef Callaghan. MALAYSIAN BORN Australian artist Stef Callaghan and County Antrim's George Callaghan are known for their vibrant, colourful, and distinctive style of painting, and Galway will be able to see both exhibit together. Callaghan & Callaghan – New Works is the title of a new exhibition currently running at The Kenny Gallery, Liosbán Retail Park, Tuam Road. It is part of the 2016 Galway Fringe Festival. Stef Callaghan's paintings are idyllic, and explore interactions between people in their daily pursuits, with voluptuous women depicted in bright landscapes suggesting perfect sisterhood. George Callaghan left school at 15 to work as an apprentice commercial artist, later studying at Belfast College of Art. He worked in advertising agencies in Dublin and London and eventually in Sydney, Australia. In 1973 he relocated to Tasmania. He paints in a naïve style, deliberately without depth or perspective. Below is his painting The Regatta. The exhibition runs until August 5. Gallery opening hours are 9am to 5pm, Mondays to Saturdays. Admission is free and all are welcome.